The king of all dinosaurs, the carnivore of all carnivores, the Tyrannosaurus Rex is one mean killing machine. On the front of this t-shirt you will find a realistic image of a large T-Rex skull, it is very detailed showing each hole and crevasse in the skull and it also shows off the large sharp teeth each looking as deadly as the Tyrannosaurus Rex. The T-Rex skull t-shirt is available in a wide variety of sizes and is made from 100% cotton to give you a very soft and comfortable t-shirt while also being extremely durable to last a long time. 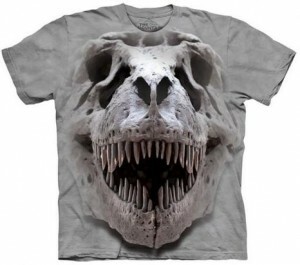 Have a closer look at this T-Rex Skull T-Shirt.